I thought we should have a topic where we can post photos of all our amigas. 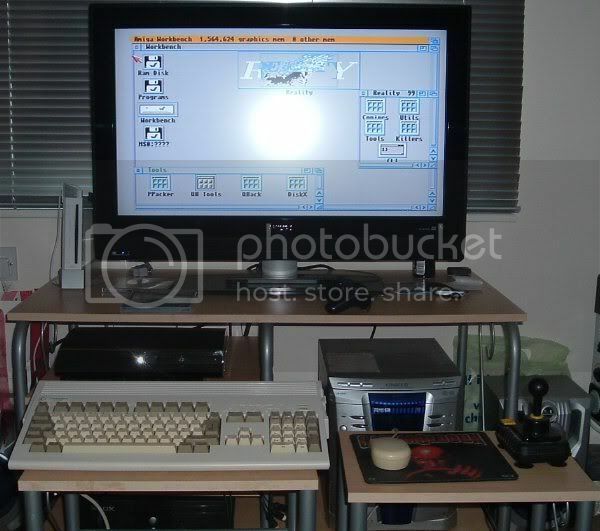 The photo shows the A500+, with the HD, Cumana disk drive, Microtext, and 8833-II monitor. The Amstrad DMP2000 is under the desk. The HP DeskJet is in the airing cupboard behind the desk and the Goodmans video recorder which gets used as a TV tuner for the 8833 is on the floor in front of the draws. I will take a better photo with the digital camera later. My A1200 was set up like this earlier this year. It is currently in the loft unused. I don't think I had the CDRW drive connected in this photo but when I have had it connected in the past it went behind the A1200. The thing sticking out of the side is a PCMCIA ethernet card. the monitor is an Amiga Technologies 1438S. the Power supply is an modified ATX one. This is located on the shelf above the printer. 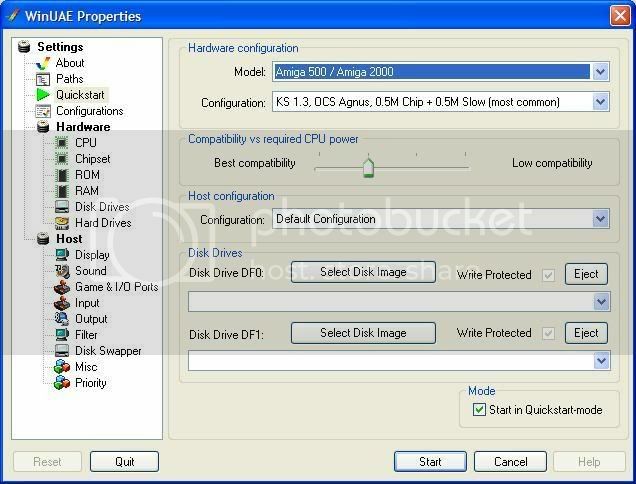 The Canon IP4000 is not connected to the Amiga. I think many ppl may have the same. I'll have to take a photo of my (working) A1200 some other time. I've been meaning to do some photographs of my Amigas. I will see if I can this week and post some images. BTW, Steve, I think you need a bigger desk! And how come you're not using the A1200 at the moment? Looks like you had it set up nicely before. I am not using the A1200 now, because I had to remove it from that desk in order to put the PC there (I needed to use the PC), but now I have the television and video recorder on that desk and have no where for the PC (it is currently sitting on the floor). And i don't use the A1200 much. The only other options for having the PC set up properly would be if I moved it onto a desk in the loft (which I was planning to do but decided I couldn't be bothered), or I could get an LCD monitor and put it on my other desk (which I like to reserve for the lapto and writing, so I can't put my big trinitron there). The HD for the A500+ takes up too much room on the desk. What I could do with is some sort of cable so i can have the HD connected to the A500+, but I could then put the HD somewhere else, like on the floor, so it isn't taking up space on the desk. Actually I have Amigas, but unfortunately no photo camera I didn't buy one yet, because I don't really need one. Will take a photo tonight and post it. It has an original commodore mouse (still working, with heavy duty ball), and a rather classy (albeit not Amiga related) Carmageddon mouse mat. It is connected to the tv through my DVD recorder as it is easier than unplugging the Wii to play on my Amiiga (did ya see what I did there?) Lurking just behind the Amiga is my PS3, and down the bottom is the Xbox. The hifi can also be connected up and would be blasting out about 150w of cool Amiga tunes. Am currently experimenting with the Amiga set-up to fully take advantage of the TV's capacity (must work out how to get Amiga running under progressive scan ) but primarily to fully take advantage of the widescreen setting. Please note, there is nothing wrong with the cables, my colour scheme is that sucky! I'll have to ask Oz to borrow me his camera, then I'll do some photos.